From Spanish invaders to US imperialists, the Honduran struggle for self-determination has found enemies at every turn. The Lenca people say the spirits of children inhabit the Gualcarque River. The kids probably wouldn’t be pleased with a hydroelectric dam. The river is sacred to the Río Blanco community of indigenous Lencas in western Honduras, and an important source of water. It’s also the proposed site of the Honduran DESA Corporation’s Agua Zarca dam. Fearing displacement, the people of Río Blanco have vociferously opposed the dam for years, even as DESA established itself on contested land. But when DESA posted security guards and “No Trespassing” signs along the river in spring 2013, residents took matters into their own hands. The morning of April 1, 2013, community members gathered at a high point of DESA’s access road, the area’s wide blue skies and rolling forest-green hills on display. There they formed a human blockade, dug a trench big enough to sink a truck tire, and built a fence across the road with sticks and thick metal cable. Tense months followed. Supporters of the dam brandished machetes at opponents and made verbal threats. Honduran National Police made multiple attempts to evict the protesters. A protester’s coffee crop was burned. Hoping to put an end to the tensions, several hundred community members marched down to DESA’s riverside headquarters on July 15 to reiterate their opposition to the project. “There was a soldier there who may have been nervous,” one Río Blanco resident told me last year. Near the head of the community group was Tomas García, a forty-nine-year-old father of seven. As they approached, Honduran army Sergeant Kevin Jasser Sarabia, stationed outside the DESA offices, began firing shots into the air. Witnesses say García made clear the group’s desire to have a peaceful conversation. Jasser must have thought otherwise when he lowered his weapon and fired several shots, killing García and wounding his seventeen-year-old son. The people of Río Blanco are fighting a long fight. Hondurans living on rich lands have faced violence and displacement for centuries, as Spanish colonizers sought gold and American banana barons sought profit. Today, a new wave of bloodshed is sweeping Honduras as a domestic elite looks to increase its outsized share of the nation’s wealth. It has claimed over one hundred lives since 2009. But if it’s a war, it’s a one-sided one, with the violence directed mostly at subsistence farmers who oppose land grabs for agribusiness, mining, or hydroelectric projects. García was the first inhabitant of Río Blanco killed in the Agua Zarca dam dispute. Since his murder four others have died violently. Two alleged DESA sicarios, or hitmen, died in the aftermath of an ambush on dam resisters in April 2014. A month later, anti-dam activist William Jacobo Rodríguez was killed while he was walking home late at night; Rodriguez’s fifteen-year-old brother Maycol was disappeared and found dead in October. Opponents of the dam project still face regular threats and harassment, but the roadblock continues and construction remains stalled. In the province of Yoro, residents of the Locomapa community blockaded a mining company’s road in 2013 after the company failed to deliver compensation it had promised to residents. Ten days into the protest, alleged company sicaros Carlos Matuté and Selvin Fúnez Matute arrived on a motorcycle, pulled weapons, and fired into the crowd, killing three. The Inter-American Court of Human Rights has ordered “precautionary measures” for the security of thirty-eight Locomapa residents, but police protection is scarce. The Matutes still roam Locomapa, occasionally brandishing firearms and making threats. The cooperatives’ local owners responded with legal action and, when that failed, land occupations. The efforts have been met with a brutal backlash. Reports by Human Rights Watch and other watchdog groups implicate the private security forces of palm oil companies in many of the killings. A small group of families control 90 percent of Honduras’s wealth. Known as the “ten families,” or simply “the oligarchy,” most made their wealth during the early twentieth century in industries related to the US banana trade. Together, they own just about all of the major private institutions in Honduras: newspapers, TV and radio stations, fast food franchises like Burger King and Pizza Hut, banks, hotels, soccer teams. The ten families are also implicated in many Honduran land conflicts. Miguel Facussé, the wealthiest of the oligarchs, owns the Dinant palm oil and snack food corporation; the company’s security forces have been linked to multiple murders on Bajo Aguán plantations. Facussé also claims disputed land in Zacate Grande. Meanwhile, one of his sons-in-law, Lenir Pérez, is trying to establish a mine on contested land in northern Honduras, and human rights activists at the site have been subject to kidnapping and death threats. David Castillo, the head of the DESA dam company, is a former Honduran military official who retains close government ties. In most cases, private security or paid hitmen do the dirty work, but the elites occasionally intervene directly. In one instance, two anti-mining activists reported receiving death threats from Lenir Pérez by text message in 2012. Nationwide, the ten families are on the offensive. In 2009, they pulled off a coup against left-leaning President Manuel Zelaya. The ousted president had made a number of modest challenges to the oligarchs’ power, including Decree Law 18-2008, which would have titled almost one hundred thousand acres of disputed land to peasant families. Honduran military expert Leticia Salomón claims that the coup was organized by former president Carlos Flores Facussé — nephew of Miguel Facussé, the palm oil magnate — and financed by other heads of the ten families. Welcome to Honduras, where Pizza Hut franchisees bankroll coups and snack food companies are linked to peasant murders. The United States provides subtle but important support for this oligarchy. The US offered boilerplate condemnation of the 2009 coup when it occurred, but then helped legitimize the new government, recognizing the results of widely boycotted elections five months after the coup. In return, it has gained a host for new military bases, a Honduras “Open for Business” for foreign investors, and an ally in left-leaning Latin America. The US also funds the Honduran military and police, and many Honduran commanders have received training at the School of the Americas — including Colonel Milton Amaya, head of the troops defending the dam company land in Río Blanco. After the coup, the Honduras Supreme Court declared Law 18-2008 unconstitutional. Land violence skyrocketed. The ten families began using the state as a bludgeon against Hondurans and their land rights. While the suspected killers of peasants rarely face arrest or trial, activists peacefully defending their land often face criminal charges. In one case, Berta Caceres, head of the indigenous rights group COPINH and one of the organizers of the Río Blanco hydroelectric dam blockade, is facing charges of “usurpation, coercion, and continued damages.” Her case is pending in the Supreme Court. Police and military also actively collaborate with land-hungry companies. In Río Blanco, Honduran troops are stationed on the DESA Corporation’s land. The military also frequently intervenes in the Bajo Aguán African palm plantation region, in one case burning down nearly an entire town built by palm plantation occupiers, destroying over one hundred houses, and bulldozing three churches and a schoolhouse. Private security guards for palm oil companies are sometimes permitted to wear police uniforms and participate in joint operations with law enforcement. And the human rights group Rights Action has documented how one military battalion participated in extrajudicial executions, forced disappearances, and torture. As the oligarchs systematize their encroachment on others’ lands, they become the heirs to a long history. Lenca indigenous leader Lempira sounded alarms across the Honduran countryside in late 1537. Lenca warriors congregated at the Peñol de Cerquin, a fortified mountaintop fortress in the same western mountain range where Lencas would build their anti-dam blockade five centuries later. Lempira’s escalation caught Spanish colonists by surprise, and they sent emissaries to the Peñol to try to prevent rebellion. The Lenca commander had them executed. Columbus had first claimed Honduran territory for Spain in 1502, and by the time of Lempira’s rebellion, the colonial project was well underway. Spain was already exporting large numbers of native Hondurans as slaves to Caribbean sugar plantations, and the budding colonial power had begun installing Spanish encomenderos as the tribute-receiving lords of native lands. Indigenous Hondurans launched unsuccessful rebellions against the newcomers, or fled to areas unclaimed by colonists. The Spaniards’ first assault on the Peñol de Cerquin failed, and a wide swath of Honduras’s native population erupted in revolt. Spanish settlers were ambushed and killed throughout the province, rebels laid siege to colonial population centers, and colonial leaders sent urgent appeals to other colonies for reinforcements. The Spaniards regained ground, but were unable to capture the Peñol. After six months of siege, Lempira was lured out of his fortress on the premise of peace talks and shot by a concealed Spanish soldier. Resistance to the Spaniards quickly fractured, and Spain began to cement its control over the colony that would become Honduras. The land’s new masters upended the economy, shifting its orientation from domestic subsistence to trans-Atlantic export. Conquered Hondurans were forced into the repartimiento tribute labor system, and later debt servitude in mines and on ranches. Brutal gold and silver mining — along with Old World diseases — reduced local population so drastically that Spain had to import African slaves. After precious metal deposits were depleted at the end of the 1500s, Spaniards consolidated their rule on large hacienda estates, but it would be hundreds of years before the nation would find another major export. Honduras declared its independence in 1821. Within a century of the nation’s freedom from Spain, American banana companies had effectively established themselves as a new colonial power. They drew on a familiar set of tactics. When the Honduran government gave Samuel Zemurray’s Cuyamel Fruit Company unsatisfactory land concessions in 1910, Zemurray responded as any good businessman would: he enlisted the help of Honduran presidential hopeful Manuel Bonilla, hired a cohort of American mercenaries, and landed on the Honduran coast with automatic weapons. Six hundred casualties were inflicted on Honduran troops in the ensuing battle. Bonilla was installed as president, Zemurray got his concessions, and American mercenary Lee Christmas was put in charge of the Honduran army. He tasked his deputy, former New Orleans policeman Guy “Machine Gun” Malony, with removing peasants from Cuyamel’s new lands. The leading fruit companies controlled as much as 20 percent of arable Honduran soil by 1917. As banana companies built their plantations, they muscled smallholders into selling their land; small-time banana producers who didn’t sell often found their product deemed unfit for export by government inspectors. Strikes by plantation workers were violently suppressed by the army. When civil war broke out in the 1920s, competing fruit companies backed opposing sides (Cuyamel even smuggled arms into the country on behalf of the Liberal Party). In 1963, a coup preempted President Ramón Villeda Morales’s plan to expropriate uncultivated United Fruit land. As late as 1977, a group of peasants who tried to bypass Standard Fruit and bring their products directly to market were branded as communists and thrown in jail. 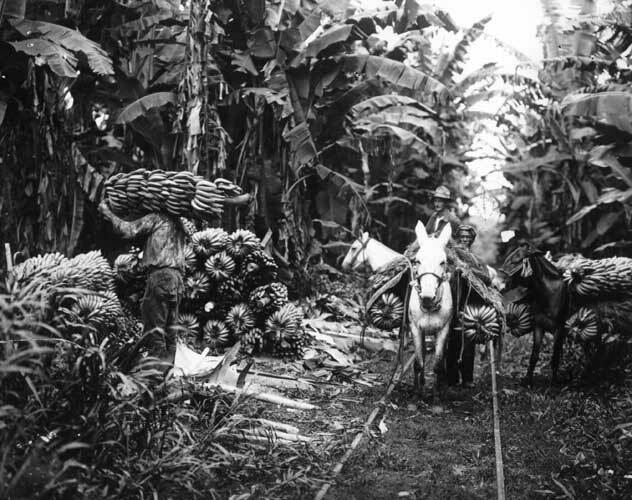 Hondurans mounted resistance to the banana empire, and by the 1950s labor organizing on banana plantations had become dangerously potent. As a concession to the increasingly militant workers, the government set aside land and organized the Bajo Aguán peasant palm oil cooperatives in the 1960s and 1970s, where many former banana company workers were able to work and own their own land for a generation before coming into conflict with Miguel Facussé and the oligarchs in the 1990s. Honduras is a very different country than it was during the colonial and banana eras, but broad patterns of power persist. The aggression against rural Hondurans across the centuries is often state-sanctioned, and it almost always facilitates the export of Honduran wealth to other nations. We dream of a Honduras in which we have the right to be happy. It’s the most insurrectionary, most subversive, they could say the most “terrorist” right there could be. The right to be happy. It seems so simple, so plain, so easy, but it has a really deep meaning. It has to do with peace with justice, it has to do with the end of impunity, it has to do with the respect of spiritual and territorial rights. . . . That this country be ours, that’s what we dream of. Five hundred years after Spanish colonization, a powerful elite piles up the bodies of the peasants who oppose them, without losing its suit-and-tie respectability or American military assistance. What will it take for Hondurans to finally be allowed to make their country theirs?